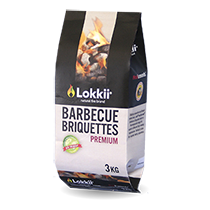 Lokkii's Instant BBQ Charcoal Briquettes are used in our Instant BBQ’s. No artificial fillers or artificial binders are used. 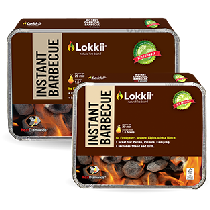 Lokkii's Instant BBQ is easy and clean to use: remove the BBQ from the wrapper, place the BBQ on the stand (included), just light the internal bag in each corner and in 15-20 minutes you are ready to cook. 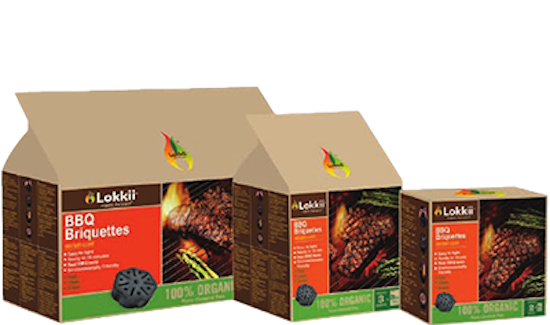 Lokkii's Instant BBQ uses the patent pending HeatDiamonds®, a superior briquette, that ensures an even heat source, higher cooking temperatures that sear in the flavor, while keeping the food tender and tasty. Q1. 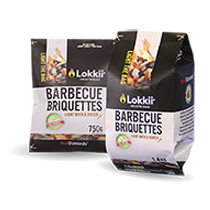 What is used in Lokkii® Instant BBQ Charcoal Briquettes? 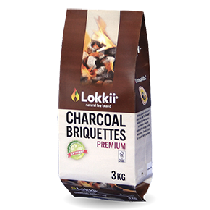 Lokkii® Instant BBQ Charcoal Briquettes contains Lokkii® patented HeatDiamonds® briquettes that is composed of pure charcoal and natural binders. The ignition formula is 100% organic. No artificial elements are used in the composition of Instant BBQ HeatDiamonds®. Q2. 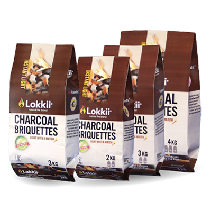 How healthy are Lokkii® Instant BBQ Charcoal Briquettes compared to traditional instant light charcoal? Traditional instant light BBQ's contain cancer-causing agents such as petro-chemicals or nitrates that are used to ignite the briquettes. 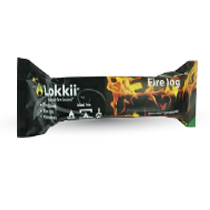 Lokkii® Instant BBQ Charcoal Briquettes are ignited by 100% organic ignition formula. The formula has been extensively tested; tests prove the formula does not contain harmful chemicals that can transfer into the food you eat. Q3. 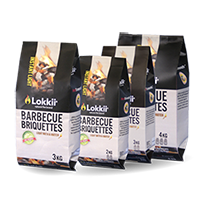 What is the best way to Lokkii® Instant BBQ Charcoal Briquettes? Place the BBQ on a clean flat outdoor surface. Once the BBQ is removed from its protective wrapping light the internal bag in each corner using a match or butane lighter, once the bag has ignited, the briquettes will start to burn, once hot spread the briquettes across the bottom of the BBQ and you are ready to cook. Never put ignition fluids on instant light BBQ. Q4. 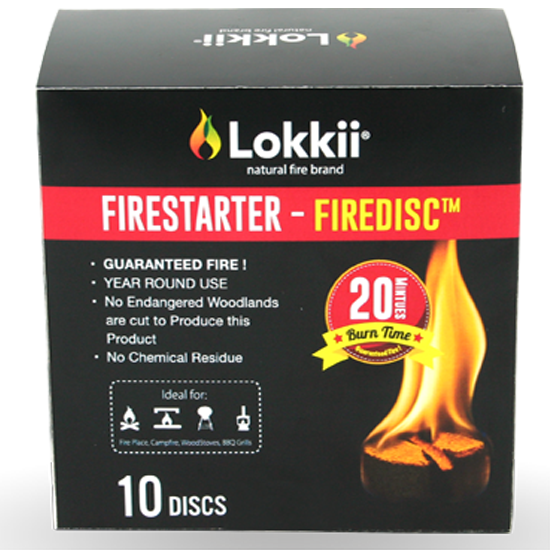 How long do I have to wait until Lokkii® Instant BBQ Charcoal Briquettes is hot enough to begin cooking? 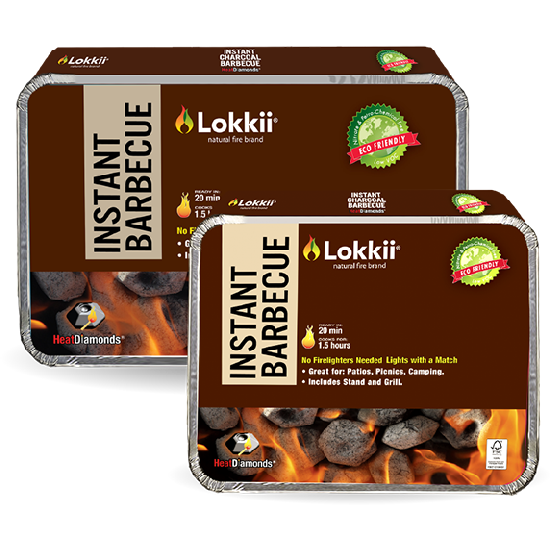 Lokkii® Instant BBQ Charcoal Briquettes is quick and easy to use, once lit you can start to cook in about 20minutes. If you are cooking in a very cold climate, it may take a few more minutes, but in a hot climate you may be ready to cook in less time. Q5. 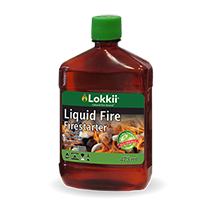 How hot does Lokkii® Instant BBQ Charcoal Briquettes burn? The unique patented shape of HeatDiamonds® burns >29MJ per kilo. The high temperature sears the meat, seals in the juices and grills the food to perfection. Q6. 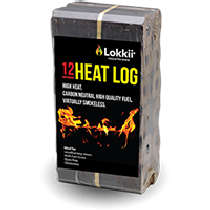 How long do Lokkii® Instant BBQ Charcoal Briquettes stay hot? Once the briquettes are hot, depending on the BBQ you are using and the manner in which you are cooking, Instant BBQ will burn evenly and remains hot for 1.5-2 hours. Q7. What should I do with the leftover ash and the BBQ after the briquettes are completely burnt? First be absolutely sure that the ash/residue is completely cool. The base of the Instant BBQ is made from aluminum foil. Dispose of the BBQ in a responsible manner. Always consider the environment.